2. a) What is the main point of Stephan Pastis’ cartoon? c) What is your reaction to this cartoon? How will you commemorate Memorial Day this year? -Call your city hall to ask if the city will hold a Memorial Day ceremony. -Call your local VFW, AmVets or DAV for information on their Memorial Day ceremonies. 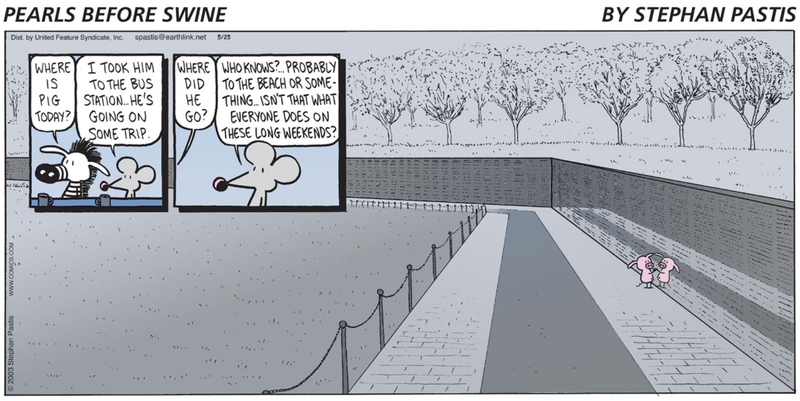 2. a) The point of Mr. Pastis’ cartoon is that Memorial Day is not just about the beginning of summer, barbecuing or going to the beach or the lake – it is a day to remember and honor military service members who gave their lives while serving/defending our country.